The right solution for loudspeakers, horns, and amplifiers. From a simple, stand-alone PA system to a wireless network sound system, ATD has the answer. ATD offers a variety of wired and wireless Public Address paging systems. They can be programmed to activate and communicate with each paging receiver individually or as part of multiple paging zones. We offer the top manufactures in the industry such as Bose, Bogan, Fourjay, Valcom, Visiplex and many others. Bogen's Commercial and Pro Audio line of business, along with Bogen's NEAR and Apogee Sound brands, expands the Bogen family of products to address applications ranging from single speaker systems to large-scale concert music systems. 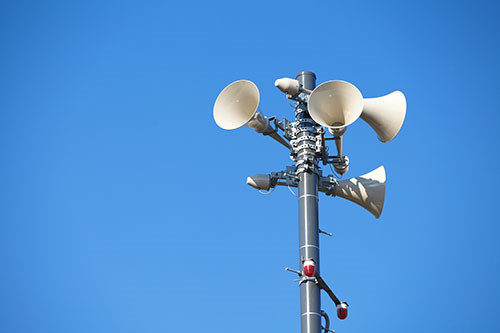 Fourjay Industries designs and manufactures Paging Horns, Loudspeakers and Mounting Accessories, for a variety of applications ranging from background music and sound masking, to fire-safety public address and telephone based paging systems. They also sell a wide variety of Amplifiers, Attenuators, Transformers and Customized products for specialized applications. Valcom’s unique and extensive experience in IP and Analog Voice Paging systems, IP Centric Multimodal Systems and Telecommunication Enhancements give us a unique perspective. They are well known for providing guidance and assistance in implementing everything from the simplest paging system to the most complex mass notification communications system solution. Valcom’s customer base includes most of the Fortune 500 companies, the majority of highly secure US Government facilities, local government emergency service organizations, and over 35,000 schools.